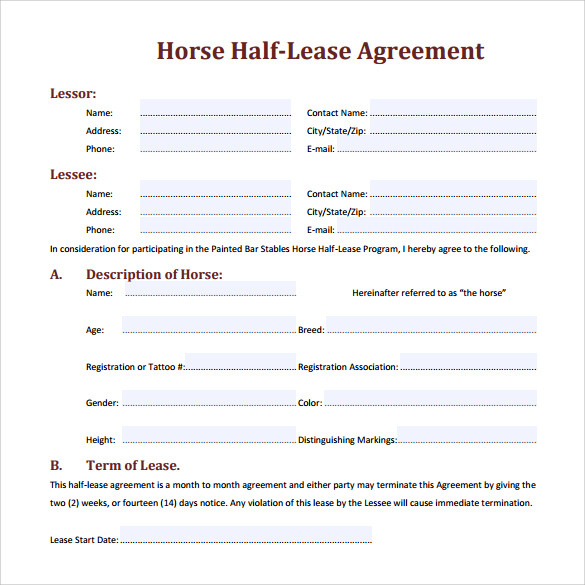 A Horse Lease Agreement is the binding document where in the lessee leases the owner’s horse for a fixed duration of time upon agreeing to pay a predefined rent to the owner. The name, color, age and breed of the horse are stated in the Lease Agreement Templates document. The duration of the lease and mode of payment are defined clearly. In case of any injuries occurring to the horse during the duration of agreement, lessee may bear the responsibility and pay for the corresponding veterinary expenses. 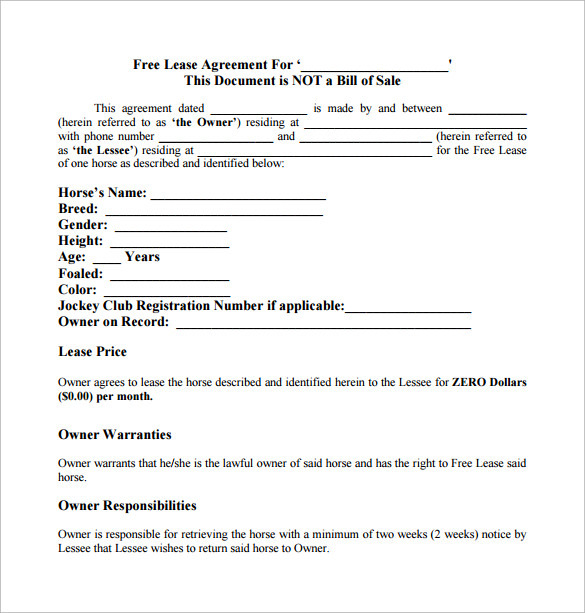 You can download templates for Horse Lease Agreement right here in word and PDF format. This is a horse lease agreement on part time basis. In the lease agreement, the details of the lease like time of commencement, and time of conclusion are mentioned, along with the name and address of both the parties, and information regarding the horse. At the top of this horse lease agreement the duration of the lease has been mentioned. This is followed by the name of the parties of the lease and a detailed account of the horse, including its breed, height, etc. 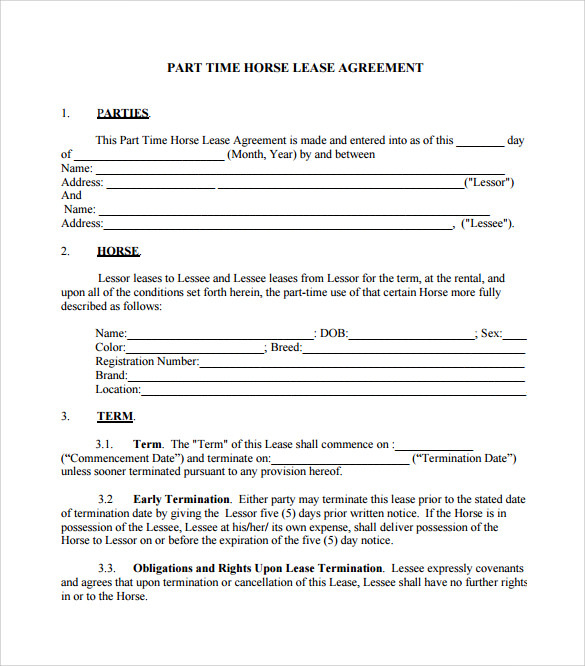 This horse lease agreement is made in PDF format and starts with the dates of the lease agreement. The details of the lease agreement are also mentioned in this template which contains the price of the horse, and its insurance value. 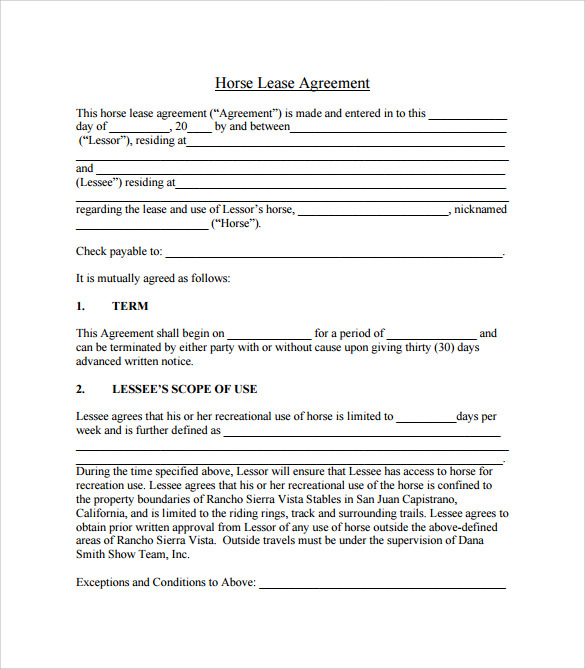 This is a half lease agreement for a horse, and the template provides space for giving details of the leaser and the leasee of the horse. There is also the details of the horse mentioned, followed by the term of the lease. 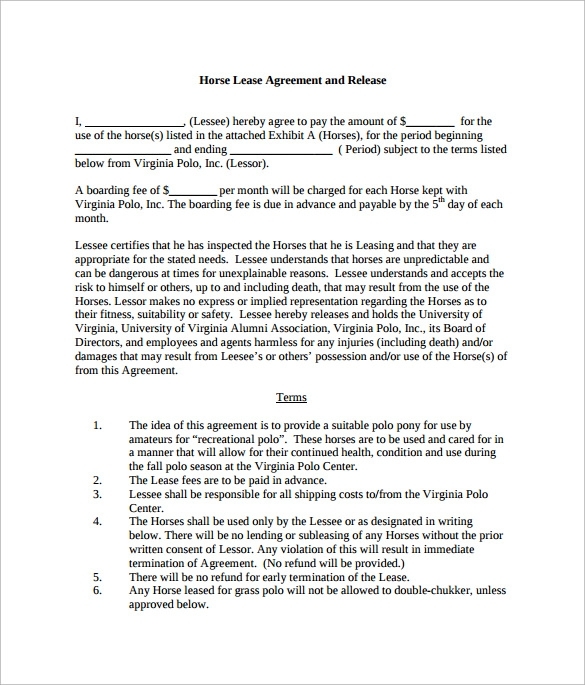 Why Do You Need A Horse Lease Agreement? Taking a horse for a lease for a stipulated period of time is not an uncommon thing. In such cases it is important to have a document, preferably legal, which is binding upon the two parties, one who is offering the lease, and the other who is taking it. This is why it is important to have horse lease agreement. The agreement should be such which must mention the responsibility of the leasee for the injury or death of the horse during the period of lease, so that if something happens to the animal, it can get proper treatment too. You may like Blank Lease Agreements. Who Needs a Horse Lease Agreement? 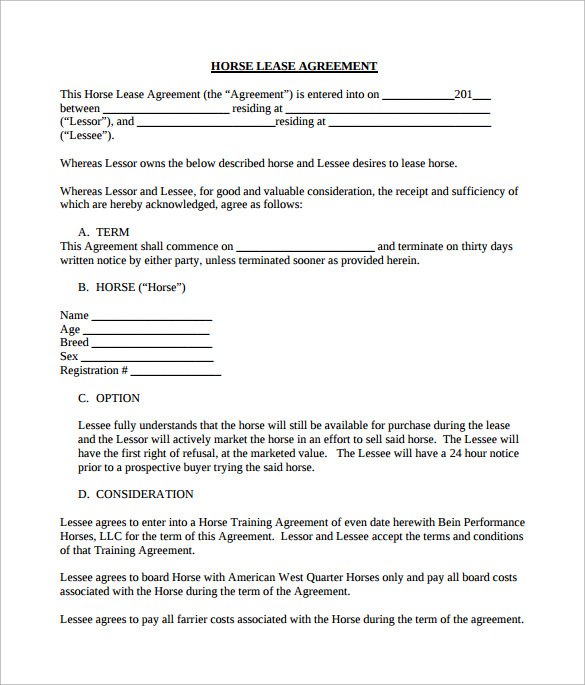 A horse lease agreement is a document which is binding on both the leaser of the horse and the lease. Therefore, whoever is leasing out the animal and whoever is taking the lease needs the lease agreement. A lot of people lease out their animals, for economic purposes. On the other hand a number of people take lease of the horse, since buying a horse for a short term is not practical or economic. Therefore, the prefer hiring a horse for a certain period. Both of them therefore need a Lease Agreements in order to protect their interest as well as the horse. 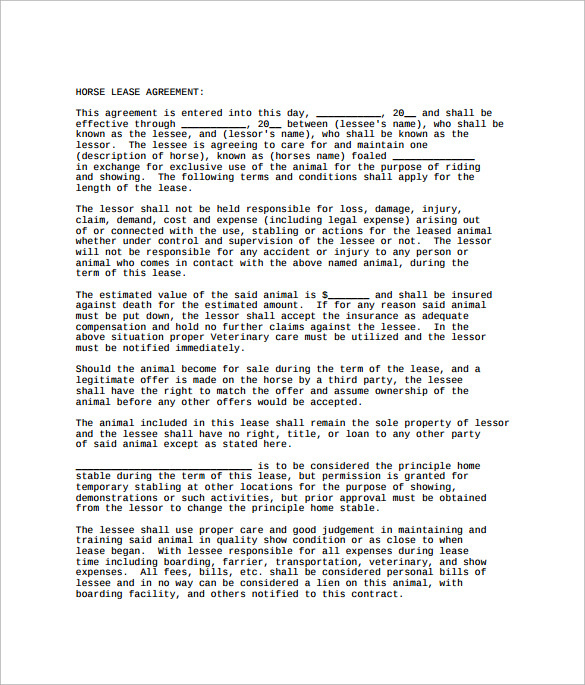 How To Make A Lease Agreement? 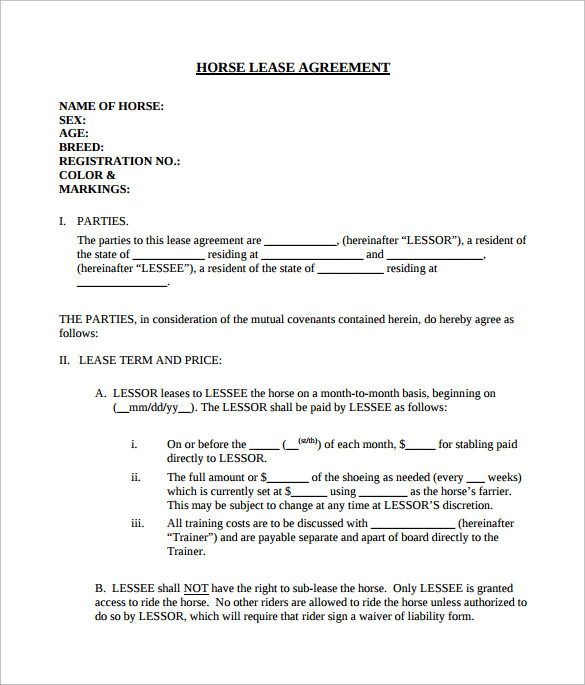 If you are leasing out your horse or taking a horse for lease, you will need a lease agreement. Making a lease document is not too difficult. You can follow the templates available on the internet for this purpose. There are a few details you must include in your agreement. Make sure you include the name and contact of both the parties, along with the duration of the lease agreement. You also need to provide the details of the horse. Moreover, including the terms of the lease, in the lease deed, such as what to do if there is an accident during the period, is very important. There are a number of lease agreement templates available in the internet for leasing a horse, and you can easily download and provide the relevant information and make it useful for you. While using these templates make sure, they have all the important conditions of the lease mentioned in them.